The basic concepts of the Marshall mix design method were originally developed by Bruce Marshall of the Mississippi Highway Department around 1939 and then refined by the U.S. Army. Currently, the Marshall method is used in some capacity by about 38 states. The Marshall method seeks to select the asphalt binder content at a desired density that satisfies minimum stability and range of flow values (White, 1985). National Asphalt Pavement Association. (1982). Development of Marshall Procedures for Designing Asphalt Paving Mixtures, Information Series 84. National Asphalt Pavement Association. Lanham, MD. Asphalt Institute. (1997). Mix Design Methods for Asphalt, 6th ed., MS-02. Asphalt Institute. Lexington, KY. It was designed to stress the entire sample rather than just a portion of it. It facilitated rapid testing with minimal effort. It was compact, light and portable. It produced densities reasonably close to field densities. WES continued to refine the Marshall method through the 1950s with various tests on materials, traffic loading and weather variables. Today the Marshall method, despite its shortcomings, is probably the most widely used mix design method in the world. It has probably become so widely used because (1) it was adopted and used by the U.S. military all over the world during and after WWII and (2) it is simple, compact and inexpensive. All gradation specifications must be met. Typical specifications will require the percent retained by weight on particular sieve sizes to be within a certain band. The gradation should not be too close to the FHWA’s 0.45 power maximum density curve. If it is, then the VMA is likely to be too low. Gradation should deviate from the FHWA’s 0.45 power maximum density curve, especially on the 2.36 mm (No. 8) sieve. The Marshall test does not have a common generic asphalt binder selection and evaluation procedure. Each specifying entity uses their own method with modifications to determine the appropriate binder and, if any, modifiers. Binder evaluation can be based on local experience, previous performance or a set procedure. The most common procedure is the Superpave PG binder system. Once the binder is selected, several preliminary tests are run to determine the asphalt binder’s temperature-viscosity relationship. The Marshall method, like other mix design methods, uses several trial aggregate-asphalt binder blends (typically 5 blends with 3 samples each for a total of 15 specimens), each with a different asphalt binder content. Then, by evaluating each trial blend’s performance, an optimum asphalt binder content can be selected. In order for this concept to work, the trial blends must contain a range of asphalt contents both above and below the optimum asphalt content. Therefore, the first step in sample preparation is to estimate an optimum asphalt content. Trial blend asphalt contents are then determined from this estimate. The Marshall mix design method can use any suitable method for estimating optimum asphalt content and usually relies on local procedures or experience. Based on the results of the optimum asphalt binder content estimate, samples are typically prepared at 0.5 percent by weight of mix increments, with at least two samples above the estimated asphalt binder content and two below. Tamper foot = Flat and circular with a diameter of 98.4 mm (3.875 inches) corresponding to an area of 76 cm2 (11.8 in2). Compaction pressure = Specified as a 457.2 mm (18 inches) free fall drop distance of a hammer assembly with a 4536 g (10 lb.) sliding weight. Number of blows = Typically 35, 50 or 75 on each side depending upon anticipated traffic loading. Simulation method = The tamper foot strikes the sample on the top and covers almost the entire sample top area. After a specified number of blows, the sample is turned over and the procedure repeated. Figure 1. Marshall drop hammers. The Marshall stability and flow test provides the performance prediction measure for the Marshall mix design method. 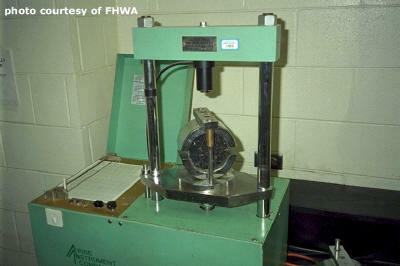 The stability portion of the test measures the maximum load supported by the test specimen at a loading rate of 50.8 mm/minute (2 inches/minute). Basically, the load is increased until it reaches a maximum then when the load just begins to decrease, the loading is stopped and the maximum load is recorded. During the loading, an attached dial gauge measures the specimen’s plastic flow as a result of the loading (Figure 2). The flow value is recorded in 0.25 mm (0.01 inch) increments at the same time the maximum load is recorded. Figure 2. 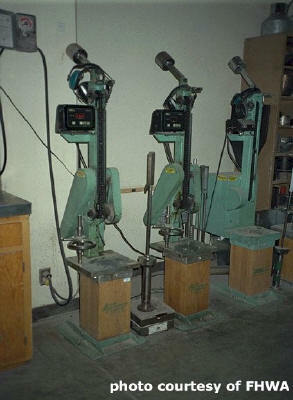 Marshall stability testing apparatus. Typical Marshall design stability and flow criteria are shown in Table 1. Asphalt binder content vs. density. Density will generally increase with increasing asphalt content, reach a maximum, then decrease. Peak density usually occurs at a higher asphalt binder content than peak stability. * Stability increases with increasing asphalt binder content, reaches a peak, then decreases. * Stability decreases with increasing asphalt binder content and does not show a peak. This curve is common for some recycled HMA mixtures. Asphalt binder content vs. flow. Asphalt binder content vs. air voids. Percent air voids should decrease with increasing asphalt binder content. Asphalt binder content vs. VMA. Percent VMA should decrease with increasing asphalt binder content, reach a minimum, then increase. Asphalt binder content vs. VFA. Percent VFA increases with increasing asphalt binder content. Determine the asphalt binder content that corresponds to the specifications median air void content (typically this is 4 percent). This is the optimum asphalt binder content. Determine properties at this optimum asphalt binder content by referring to the plots. Compare each of these values against specification values and if all are within specification, then the preceding optimum asphalt binder content is satisfactory. Otherwise, if any of these properties is outside the specification range the mixture should be redesigned. Figure 3. Selection of optimum asphalt binder content example (from Roberts et al., 1996).